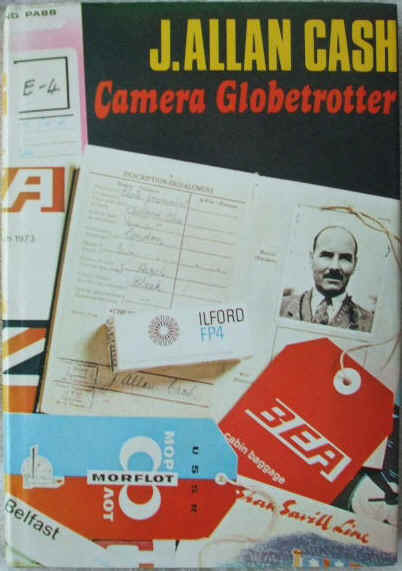 First UK edition, first print hardback of CAMERA GLOBETROTTER by J Allan Cash and published by Fountain Press, Hertfordshire in 1973. The book is in very good condition (clean brown cloth boards and gold lettering on spine) with only slight wear to the illustrated dust jacket, which is not price clipped (minor creasing to the edges, only minor foxing and tanning around the edges inside the jacket). Internally, the pages are clean and tight and there are no tears and no inscriptions. There is very minor foxing and tanning to the page ends and endpapers. As well as being one of the UK’s most recognized travel photographers, James Allan Cash F.R.P.S, F.I.B.P was also a well-known writer and was one of the founders of the British Guild of Travel Writers. From the late 1930’s, James Allan Cash traveled the globe with his Leica camera. He photographed the indigenous peoples, buildings and landscapes of the countries he visited. He also spent much time in the UK and captured the historic buildings and landscapes of the cities and counties of the UK and the Republic of Ireland. Camera globetrotter is the sequel to Allan Cash's first book Living On My Camera. "In 1946, my first book was published. It was called 'Living On My Camera', and that is exactly what it was all about. In it I described how I had started my working life as a radio engineer, taking up photography and writing as a side-line and eventually switching over into this as a profession, in 1936. By the time the war came along three years later I was making a modest success of it. But the war upset all my plans and soon put me almost out of business. Luckily I was offered a post in the Army as a photographer and thus I kept my eye in throughout the war. Towards the end of the book, when I was working with the British Council as an immediate post-war job, I stated that the urge to go freelancing again was coming upon me, and that one of these days I would launch out once again into the hard cruel world as a freelance camera journalist. Soon afterwards I did just this and have really developed my whole business and photographic library since then. Together with my wife, I have built up a library of over four hundred thousand pictures. We employ seven people full time in our offices and darkroom, and our written work appears in many different publications. Recently, with an eye to securing our old age in good time, and the eventual possibility of retiring when I want to, I have merged my business with another company and we no longer have any responsibility for its day-to-day administration. This has given me a wonderful feeling of freedom. What better time to write a sequel to that first book!" 8vo - over 7¾" - 9¾" tall. 134 pages. Illustrated with colour and black & white photographs.